SAY CHEESE: Grayson Forrester, five, watches as Tony Reynolds scoops and measures out 11 ounce bowls of smoked cheddar cheese. The cheese is then rolled in pecan and parsley and refridgerated for the annual Symphony at Sunset cheese ball fundraiser. 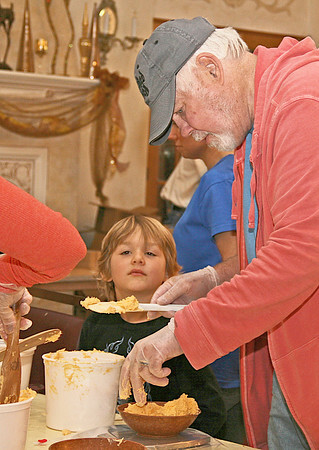 A group of volunteers gathered Sunday and Monday to prepare 1,800 of the treats, using 680 pounds of bleu and cheddar cheese. Proceeds from the $8 cheese balls goes to fund the annual Indianapolis Sympony Orchestra concert before the Fourth of July, and to sponsor local fifth-grade students on a trip to the Hilbert Circle Theatre. The organization is always looking for volunteers to help with the hours of weighing, rolling and bagging required to make the cheese balls, said Symphony at Sunset President Lori French. "It's nice to get together," she said. "Because we lost volunteers we've been asking friends, and Tri Kappa is here. People that have been in the group come back and help and we have a good time and catch up." The cheese balls are available for purchase at the Cutting Edge Salon, 115 E. Main St., Lebanon. They can also be purchased by request on the Symphony at Sunset Facebook or Twitter page, or by calling 317-440-3567.